I don't need to stand on a soapbox and tell you the benefits of being a high-performing and well-respected employee. But I'm still going to. For starters, getting a raise is a great way to accelerate your financial goals. 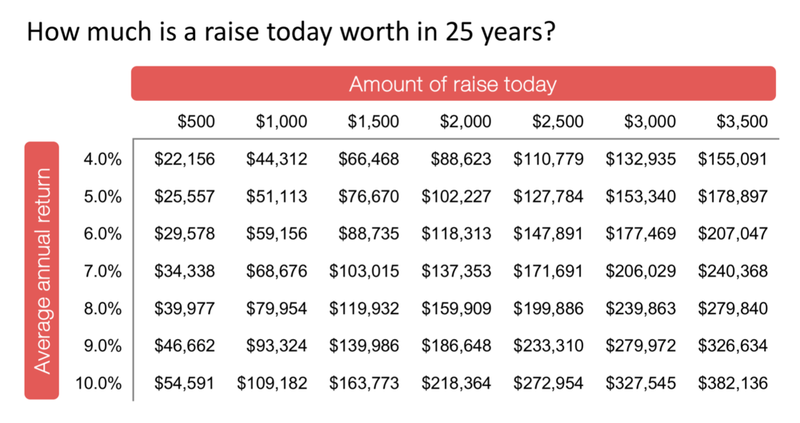 Even a relatively small raise of $2,000 amounts to over $137,000 in 25 years (assuming you continue to earn that same $2,000 each year and average a 7% annual return). Not to mention the emotional benefits of being a top performer. Of course, not every work environment can offer these factors. The specific people matter. But what better way to achieve many of these benefits than by consistently performing at a high level? Now, before I start overpromising and underdelivering (lesson #1: don't do that), let's start with some disclaimers. Unfortunately, I cannot guarantee that you will be universally praised and loved in your office, even if you follow every step. I also cannot guarantee that you will save the world if you become a top performer. Results may vary. But what I can tell you is that I have used a combination of these techniques to nearly quadruple my income in 4 years. And I wasn't exactly starting at a low number. On to the main event. 1. Anticipate your superiors' needs. Early in my career, I learned the following: your job is to make your boss' job easier. Top performers understand that it's not enough to get your work done on time. Your goal should be to help your boss handle whatever comes their way—whether it's specifically related to your job description or not. I have found that the best way to anticipate needs is to ask a lot of clarifying questions. Let's say your boss assigns you a brand new project. A "good" performer will listen closely to the task at hand and do as told. A "top" performer will ask questions to understand the purpose and goals of the task at hand. Understanding the purpose will allow you to anticipate tasks that may come up later, or even figure out a better way to accomplish the goal. Good performer: Takes notes and completes task exactly as requested. Top performer: Asks clarifying questions to understand the goal. Anticipates the next step to get ahead of requests. 2. Proactively manage your own development. My very first job was a low-intensity 9-5 with low stress. As an ambitious young kid, I was eager to learn as much as I could and develop a new skill set. Unfortunately, the work was highly repetitive and there weren't a ton of opportunities to develop a diverse set of skills. So I decided to create those opportunities. I asked for more diverse work. I did more work than required. I taught myself how to do different analyses that no one was asking for. A lot of this extra work was unnecessary and was eventually discarded by my managers. But by being proactive and going above and beyond, I quickly built a reputation as a hard worker and a thoughtful individual. More importantly, I developed a particular set of skills that I could take to my next job. And yes, the next job came with a hefty pay raise. Good performer: Learns all skills necessary to complete his/her job. Top performer: Learns all necessary skills and actively seeks additional learning opportunities to develop other desired skills. 3. Figure out who matters and position yourself appropriately. Don't get me wrong—I do not mean this in a disrespectful way. In most organizations, it is nearly impossible to keep everyone happy. Your goal is to focus on the people that have the highest impact on the organization and your career. For example, let's say you are working with two different project teams that have conflicting deadlines. Project A is led by the office rainmaker, while Project B is led by a VP who hasn't been able to close a deal recently. If you have to do more work than humanly possible and need to push back on one of these project leaders, who would you choose? No one likes interoffice politics. But completely ignoring it is a big mistake. You may not need to overtly align yourself with a particular person, but you should definitely focus on keeping certain people happy. Good performer: Works as hard as required to get all tasks completed. Top performer: Works as hard as possible for the leaders and projects that matter the most. Leverages goodwill to push away from projects with less value-add. 4. Anticipate questions or concerns and proactively address them. This is a skill that will come with time, particularly as you develop relationships with your co-workers. Whenever I send an email that contains an analysis (or anything beyond "let's get coffee") I always try to address the questions the recipients might have. If, for example, an analysis comes up with an answer that you didn't expect, you should identify the specific reasons that the answer was unexpected. Good performer: Completes work and returns the finished product. Top performer: Completes work, returns the finished product, and proactively addresses logical questions from the result. Your boss: Well now I get it. 5. Build a network within your organization to figure out who can help you. Most companies have specific procedures that need to be followed, even for the smallest of tasks. Most employees know bits and pieces of the overall process, but probably do not know the entire process from start to finish. Chances are, someone on another team can help you along each step of the way. Take some time to get to know people on these other teams. It just might come in handy as you stumble through the process. Good performer: Follows the process each step of the way with a hands-on approach. Top performer: Turns to experts for know-how. Streamlines process with the help of people who have been there before. 6. Think about the big picture. Thinking big comes into play a few different ways. On the one hand, it's important to step out of the weeds to understand the bigger picture. This doesn't need to be a complicated exercise. Think ahead. Ask clarifying questions to understand the purpose of your work and how it fits into the project as a whole. Run a sanity check to be sure your goal makes logical sense. On the other hand, it's also important to step back to remember the impact of your work. When I was working on M&A deals as an investment banking analyst, I was lucky to have worked on several deals that were featured on the cover of the Wall Street Journal. Thinking about that impact helped me make it through the (many) all-nighters. Find the broader impact of your work, and keep that in mind when the going gets tough (or boring). Good performer: Finishes work in a timely manner. Top performer: Takes the extra time to understand the overall goal. Simplifies the task to understand its logic. Steps back to remember the other people they will impact. 7. Learn how to write an effective email. The average office worker receives 121 emails a day and sends out another 40 emails a day. It's no wonder most people struggle with writing a good email. I have found that taking slightly longer to write emails (and in turn, writing a better one) reduces the number of emails required. (3) an attempt to address any logical questions or concerns the reader might have. Top performers think ahead and try to anticipate how others may react before even delivering the message. I never understood why so many people write a thoughtful email and then put the request (or call to action) at the end of the email. If the request gets buried under a wall of text, your reader will not read it. Instead, put the request at the beginning. Good performer: Sends completed analysis. Top performer: Sends completed analysis with clearly identified assumptions, drivers, and answers to logical questions. Informs the reader of any required action at the beginning. 8. Take ownership of your job. Time and again I've seen people earn average performance ratings even if they were very smart, technically strong, and could effectively perform all of the required tasks in their job. The real difference maker is holding yourself accountable for the result (even if no one else is). Taking ownership of the task is one of the best ways to prove to your superiors that you care. Good performer: Completes all required work. Top performer: Completes all required work and follows up with appropriate stakeholders to ensure the desired outcome has been achieved. 9. Position yourself for the next step. Unless you have just started a brand new job, I think it's perfectly healthy to think about your next job. What do you like in your current job? What would you like to change in your next job? And most importantly, what can you learn or do today to get one step closer to your ideal job? Using a combination of these techniques, I have positioned myself to earn better (and higher paying) jobs. And after just 4 years, I have nearly quadrupled my income. What did I miss? What techniques have you used to outperform your peers? Is Lasik surgery a good investment? I have (well, I had) terrible vision. When I'm not wearing my contacts or glasses, I can't tell how many fingers you're holding up from 3 feet away. Now I can see perfectly. The outcome has been miraculous. But is it a worthwhile financial investment? Let's reflect on the FIRE lifestyle. If you were to ask 10 random people on the street "would you like to have enough money to never need to work again?" I'd expect all 10 people to answer with a resounding "umm, YES!" On the rare occasion that I learn a friend doesn’t drink coffee I usually assume there’s something terribly wrong with them...or that they must have been picked on by baristas in their childhood. But maybe they're doing it right after all! How much more could they save in retirement by avoiding a coffee habit? It might be more than you think. Within the personal finance/financial independence community, we all love free things. What better way to advance our financial goals than to get something for nothing! But have you ever thought about the power of marketers using "free" to get people to buy more than they otherwise would have? I guarantee it has happened to you. Just about everyone wants to make a commitment to improving their health. Year after year eating better and exercising more are two of the nation's top New Year’s resolutions. But of course, millions of Americans sign up for a gym membership that they ultimately never use. Behavioral economics is the study of economic decision-making with a twist of real-life human behavior and tendencies. In the first part of a new series on the topic, learn how expectations can influence our own opinions and preferences. Since I have lived in both low-cost and high-cost of living areas in the past few years, I've spent a lot of time thinking about the pros and cons of both options. What does the math tell us? What are some ways to be a star performer at work? Learn techniques and strategies that I have used to nearly quadruple my income in just 4 years. Updated for the finalized tax bill! I know, I know. taxes are probably the last thing you want to talk about. I can't really disagree with you. Unfortunately, taxes are something you will need to worry about for the rest of your life. So on that depressing note, let's learn something that will be useful to you year after year. Learn how J (from Millennial Boss) paid off almost $100k in debt and turned her financial life around 180 degrees. J is a prolific side-hustler, with alternative income streams from blogging, podcasting, Etsy selling, and more. Take control of the things you can. Gain exclusive access to my financial model tool pack absolutely free. Check your inbox for access to the financial model tool pack. Learn how to save and budget, create alternative income streams, gain more independence and flexibility, and improve your lifestyle. Use calculators and tools to take control of your financial life.